At LiebenLogistics, operational excellence and customer satisfaction are our watchwords. To ensure that we can deliver services of the highest standard, we employ the latest technology, which enables us to reduce delivery cost. We are constantly investing and building our technology and digital capability to keep pace with trends in global technology developments, using the best of these to transform the way we do business and add value to our customers. LiebenLogistics has developed web-based, in-house management software to ensure the integration of its financial, administration, operational and technical functions. KPI reports measuring specific performance are available and provided to customers at agreed intervals. The fleet is monitored in real-time through web-based satellite tracking systems. Activities like speed, revolutions, harsh braking and door openings are tracked, and the data is then integrated into our management software. Temperatures are also monitored and any violations are reported in real-time to our teams by SMS or e-mail. 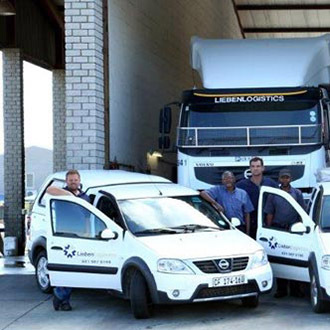 LiebenLogistics has depots and satellite operations in Cape Town, Port Elizabeth, Durban and Johannesburg. The fleet is specifically selected to ensure that operational requirements and specific customer needs are met, and costs are kept to a minimum. Maintenance and repairs are done at our own on-site workshops which are accredited by our vehicle suppliers. 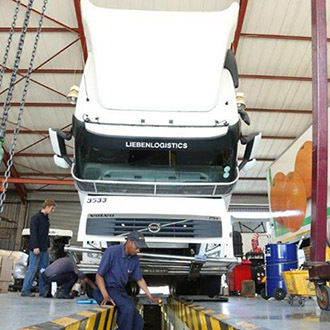 All technicians are highly skilled and trained to perform routine maintenance and repairs on the fleet to ensure that all standards, service requirements and intervals are met, thereby ensuring maximum uptime of the fleet. Our suppliers constantly provide trainers Ongoing training is provided by our suppliers in our in-house driver trainers ensuring our drivers are up to speed with the very latest in defensive and economical driving techniques. At LiebenLogistics we give utmost priority to health and safety to provide a world-class working environment for our employees. We firmly believe that our staff is key to our company’s success and make every effort to keep them motivated and empowered with continuous professional development and opportunities for employees to grow. 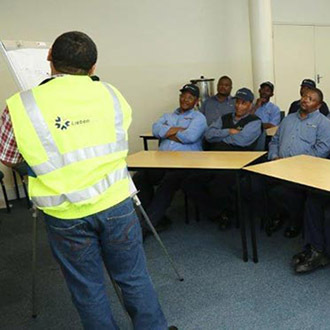 We present in-house learning and career development opportunities to ensure that quality and efficiency remain the hallmark of LiebenLogistics’ transport solutions.